If you are trying to decide if solar hot water is right for you, understanding the installation requirements and process can be helpful to better grasp the scope of a solar hot water project for your home. Like any complex mechanical device, it is important to work with a reputable professional installation company to make sure your solar hot water is correctly set up. While no two installations are exactly the same, these are the general steps that any contractor installing a solar hot water system will likely follow. 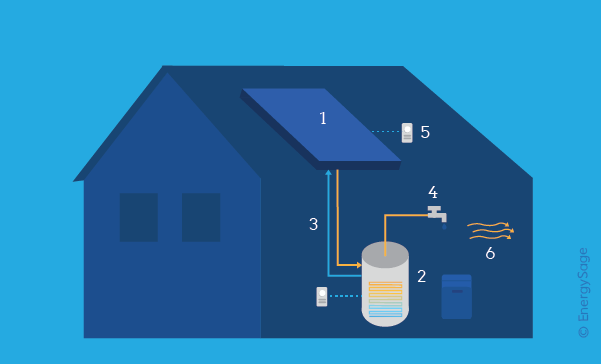 The six steps detailed below are meant to be an overview of the solar hot water installation process, and don’t reflect the exact course of action every installer might take. In most solar hot water installations, the first step is to put the solar collectors in place on your roof. Most solar hot water collectors are similar in shape to photovoltaic solar panels, and also will lie flat on your roof. In order to properly mount the collectors, your installer may need to remove portions of your roof shingling and expose the flat tar paper that acts as protection between your shingles and roof deck. Once a suitable surface has been found or created, the collectors are maneuvered into place and screwed directly into the roof deck and underlying rafters. Next, your collectors need a storage tank where they can send their heated antifreeze transfer fluid. The storage tank, and the heat exchanger contained within is, is the largest part of a solar hot water system and are usually located in a basement or utility closet,where they are accessible by water lines and antifreeze tubing. If you are replacing a gas-powered water tank, this step is essentially a replacement project. You can choose to install any number of storage tanks depending on the size of your home and your water usage. Additionally, this is when you will want to make room for and install a backup tank to be powered by electricity or gas for the times where you run out of solar hot water. In order to connect your collectors to the heat exchanger and storage tanks, your installer will run flexible piping from your roof to your new storage tank or tanks. Antifreeze fluid leaves from one pipe on the side of your collectors and runs down to the heat exchanger. An additional line will be installed to connect the end of the heat exchanger back up to your rooftop so fluid can be cycled. If you have multiple collectors, additional pipes will be installed to connect them. Installing these antifreeze piping paths requires access to your roof, which will almost always mean cutting a couple of holes in the roof deck – one for the piping that brings antifreeze down, and one for the piping that sends it back to the collectors. These holes don’t need to be larger than the pipe diameter, and can easily be covered with insulating material and replacement shingles as the installation is being finalized. As with antifreeze fluid, water needs to be cycled through your new solar hot water setup. Water transport lines, usually in the form of copper piping, need to be run from your storage tank to the rest of your home. Your home likely already has the appropriate water distribution lines set up. The only work that your installer will do is to remove your water connection from your old hot water setup and connect it to your new storage tank and backup system. As an important side note, you will also need to account for the backup hot water infrastructure. If your backup is an electric water heater, proper wiring needs to be installed. 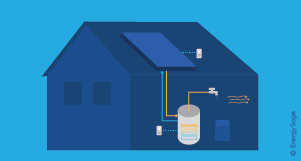 If you plan on using gas to backup your solar hot water, a gas line needs to be run to the backup storage tank. Two temperature sensors have to be connected with wiring and installed along your hot water system. One sensor should be connected to your collectors, and one to the base of your storage tank. These device will connect to the central control system and provide guidance on when to circulate antifreeze fluid. For example, if the temperature at the collectors is lower than the temperature in the tank, there’s no reason to circulate fluid – in fact, doing so will cool your water. A central control system also needs to be installed and connected to your home electricity supply. This device will act as the “brains” of your new solar hot water installation, facilitating pumping of antifreeze based on the data it receives from the temperature sensors. Once all of the pieces are in place, the last step in any solar hot water job is to insulate each part. Your installer will plug holes in your roof, insulate piping, and double check that connections between components are sealed. Any energy lost along the piping systems or within the storage tank itself is lost savings, so it is vital to insulate your system properly.